Lead time for this product is 1 - 2 Weeks. One modes of operation: normal (N) for continuous output. The timer is adjustable in 30 min., 60 min., or constant time. Dual isolated channels, two leads per channel. Pulse amplitude (constant current): Adjustable 0 - 80 mA, 500 Ohm load. Pulse frequency: Adjustable 2 ? 150 Hz. Pulse width (micro seconds): Adjustable 60-250 us. Mode selector: Burst (B), N (Normal), or Modulation (M). Timer adjusts for 30 minutes, 60 minutes or constant. Requires 1 9 V battery which lasts approx. 70 hours. Carrying case, 2 dual channel lead wires, 9V battery, 4 reusable electrodes, and manual. TENS/EMS Units & Stimulators can be found in our extensive online collection of products from globally recognized and trusted brands, including Medline. 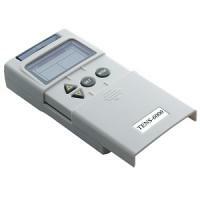 An excellent option to consider is the TENS Unit 6000, Dual Channel.